ZNN – Renowned astronomer and astrophysicist Dr. Carl Sagan revealed to Dr. J. Allen Hynek that he believed UFOs were real but avoided any public statements to prevent the loss of academic research funding. Sagan’s once powerful influence on mainstream science to play-down the reality of UFOs is now in question. This startling revelation about Carl Sagan, one of this century’s most esteemed scientists and writers, has now been made public by Paola Leopizzi-Harris, a former associate of Dr. Allen J. Hynek who worked with him from 1980 to 1985. Sagan’s link to UFOs and possibly to Dr. Hynek occurred in 1966 when Sagan was a member of the Ad Hoc Committee to Review Project Blue Book. This committee concluded that the U.S. Air Force’s Project Blue Book had been lacking as a scientific study, and recommended a university-based project to give the UFO phenomenon closer scientific scrutiny. Sagan was a prolific writer of some 20 books including Contact – eventually made into a movie staring Jodie Foster. 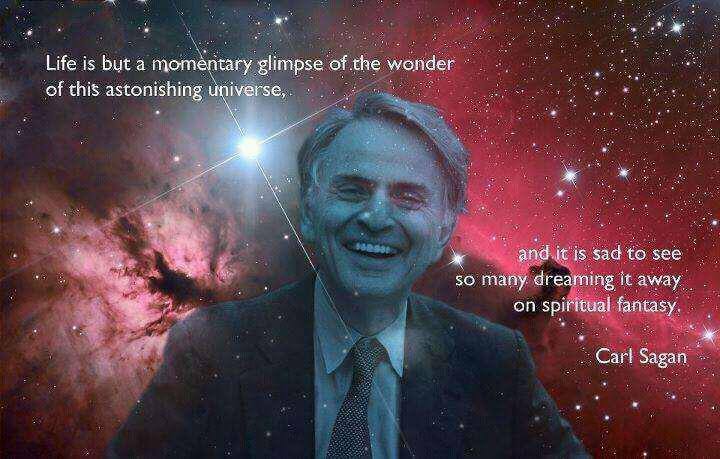 Sagan also hosted the brilliantly crafted and highly popular series COSMOS: A Personal Voyage. In Episode 12: “Encyclopedia Galactica”, Sagan explored UFOs and alien abductions while also including ‘refutations’ on UFOs. Sagan’s confidential conversation with Dr. Hynek in 1984 appears to not only contradict this statement to the House Committee in 1968, Sagan’s new found view – that UFOs were real – clearly did not play any role in Sagan’s later highly successful public work. This revelation by Paola Leopizzi-Harris appears to raise serious scientific discrepancies concerning Sagan’s public verses private beliefs about the nature of UFOs and Extraterrestrial life. It appears, therefore that Carl Sagan presumably embarked upon his many television appearances, consulting on major television and Hollywood feature productions as well as his own academic writing while professing one public scientific point of view, yet maintaining a significantly contradictory personal belief – “I know UFOs are real…” as told to Dr. J. Allen Hynek in 1984 according to Paola Leopizzi-Harris. It is unknown how long Sagan held this personal view or when and what changed his mind – future disclosures may reveal this. That Sagan presented much of his finest and most popular work outside the context of his personal belief that UFOs were real remains a salient incongruity for a man of Sagan’s stature, obvious integrity and celebratory contributions to humanity and science. One can only speculate upon why, during the period between Sagan’s initial statement in 1968 and all during his now legendary writings and media productions, Sagan continued to espouse critical views on the reality of UFOs. Why did his views change so dramatically? Did funding issues alone motivate him not to come forward publicly to declare his change-of-mind? This revelation made to Paola Leopizzi-Harris by a well-respected scientific figure like Dr. J. Allen Hynek alters if not the magnificent quality of Sagan’s work but re-constructs his considerable scientific influence on the mainstream scientific theories about the universe, the intelligent nature of UFOs and Extraterrestrial life. How will mainstream science respond knowing now that a corner stone of modern science and one of its most revered members is now recognized as to have conceded – UFOs are real? One of the 20th Century’s most renowned space gurus and scientific leaders, appears to have inadvertently shattered the prevailing notion among the scientific community and the so-called experts, that UFOs are fictitious and that issue is does not merit further study. The second conclusion – short of full disclosure by government of the UFO/ET reality, this revelation most assuredly represents the most serious damage yet to the wall of secrecy and the truth embargo surrounding the Extraterrestrial presence so ardently maintained by government officials and bolstered by mainstream science. Notably this information also comes at a time when Paul Hellyer, former Canadian Minister of National Defence has publicly admonished another pillar of mainstream science, Professor Stephen Hawking, for contributing to misinformation about advanced Extraterrestrial civilizations. Hellyer’s admonishment is timely. It puts all scientists on notice that ponderous changes to their entrenched belief about the universe and Extraterrestrial life are about to occur. The Sagan story also arrives on the eve of the X-Conference 2010 – the largest annual American UFO/ET Disclosure event coordinated by Stephen G. Bassett Director of PRG – the Paradigm Research Group at the National Press Club in Washington DC, just down the street from the White House and a President that recognizes the need for grave global change. Ironically, a cloistered conversation between to academicians behind the curtain – backstage on the set of the Johnny Carson Show in 1984 seems to have changed science and with it, the paradigm beliefs of an entire planet – we are not alone.